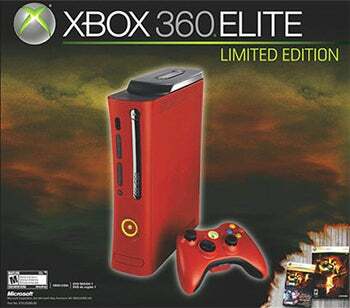 The official product page describes an "exclusive red finish" with a matching red wireless controller, plus all the other Elite goodies, Super Street Fighter II Turbo HD Remix, and of course, a copy of Resident Evil 5 itself. All that available on March 13th for $400, which is what the existing matte black model goes for with copies of LEGO Indiana Jones and Kung Fu Panda. Not half-bad, though a copy of Capcom's Street Fighter IV in lieu of II would've made it untouchable. So what do you think. Red for blood? Fear? Anger? Sin? Guilt? Courage? Sacrifice? Or, since we know Chris is faintly critical of U.S. capitalism at the game's outset, maybe you scratch off one side and there's a hammer and sickle underneath? Given the Endgadget snap, here's the thing: It seems Resident Evil 5's already in the wild (the wild being Pembroke Pines, Florida, anyway) two weeks early. Bets on how long it'll take until someone breaks street? Matt Peckham's thumping through Resident Evil 5's groping multitudes on a plain white Xbox 360 and a very wired controller. You can track his impressions of the game at twitter.com/game_on.